Snack time without the mess! This innovative little cup makes it easier than ever for toddlers to feed themselves, and puts an end to little pieces of food all over your floors. It will save you time and frustration, but also help your child to thrive and gain independence all at the same time. Your child will become more self sufficient because they are able to feed themselves, and they will build confidence because there is no risk of spillage when the cup is inevitably knocked, dropped, or thrown. This spill resistant food cup allows for easy entry of little hands, but prevents food from exiting unless it has been grabbed intentionally. Perfect for at home or on the go, Snack Trap is ideal for use in high chairs, booster seats, strollers, car seats, child carriers, bike trailers and more. Use it anywhere snacks are served to save time, build confidence and reduce mess! 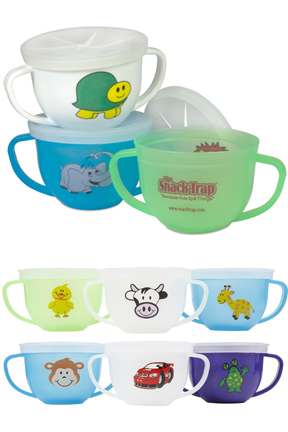 The Snack Trap consists of a double handled, tip resistant cup with a one way, specially designed top. 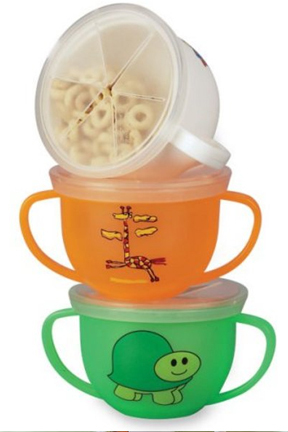 The colorful, spill preventing container has large handles that allow toddlers to grasp on easily, and maintain a steady grip as they eat. 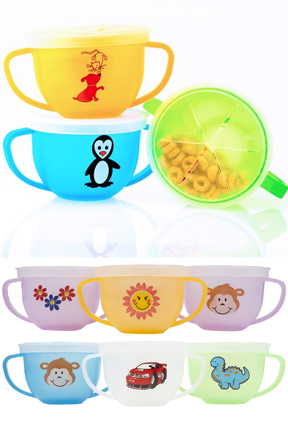 Vibrant and fun graphics on the front will make your little one smile, and encourage them to use the cup. Each one holds a good amount of food, and the clever lid grants access to little fingers, but keeps the contents from spilling. The unique, see-through lid has six slits to allow children to see what's inside and how much is left, but also gives them the ability to go in and grab it with ease. As they pull their fingers out, the slits will automatically close to prevent any pieces of food from escaping. The Snack-Trap is designed for infants and toddlers from ages 1 to 5, and it will help you minimize waste, and save time by making clean-up unnecessary. Because kids will be able to feed themselves, it will boost confidence, encourage independence, and allow children to develop new skills. No more spilled Cheerios® or Goldfish® crackers! It's great for active toddlers. So simple and useful, you'll wonder how you ever got along without it. Stop worrying about giving kids food on the go, or what a mess your house will be if your children are allowed to snack while you're not looking. This cup makes road trips more pleasant, public outings less frustrating, and snacking around the house worry-free. Since kids need to eat all the time, it's great to have a way to give them snacks without any hassle. Simply fill up the cup, place on the lid, and let them go. They can toddle around, and eat with the frequency and volume they prefer as they play, laugh and learn. Since there is no mess or spilling to worry about, you can be sure that the food will be eaten or stay inside the cup. This is a mom invented product, and it's a true diaper bag essential. It's easy-to-use, and it makes snacking on the go quick and easy. The convenient size is perfect for storage, and fits nicely in any size bag. Shaped more like a cup with a deep bottom, as opposed to a wide opening like a true bowl, the Snack Trap remains compact while allowing for ample food to be stored. Let your child snack on food without worrying about a mess afterward. It's great for riding in the car, traveling, daycare or everyday use. Get the accessory lid pack or tether to maximize the usefulness of this snacking bowl. Durable, reusable and non-toxic. Colors and style will vary. Order by gender. For specific designs or specific color bowls, please call us. Dimensions 5" x 3-3/4" x 2-1/2"
Style Varies (3 bears, butterfly, cow & chicks, dog & cat, elephant, floral, monkey & tiger, penguin, swan, teddy bear, bear & wagon, turtle & frog, turtle) For specific style requests, simply put in comments section at checkout, or call us to place the order. Color Varies (blue, white, green, red, orange, purple) For specific color requests, simply put in comments section at checkout, or call us to place the order. The perfect no spill snacking solution. Give your children the independence of feeding themselves. 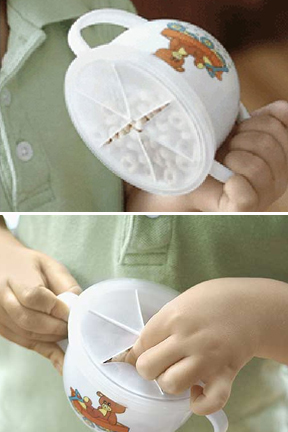 The innovative design makes it easy to grab snacks out, but at the same time keeps them from spilling accidentally. Great for families on the go! Order Yours Today! The original Snack Trap is the best snack container. I recently went on the hunt for the original after trying some newer versions. We loved the Snack Trap when my oldest daughter was little and now ten years later I am so thankful to find these again on the simplygoodstuff website for our youngest child. Great product! One Replacement Lid & One Snap Over Lid. No More Spilled Drinks, Dirty Cups, Or Thirsty Babies! A Money Saving Combo of Convenient Liquid Concentrate. 4-In-1 Action. Aromatherapy and cleanser combined. Wash, exfoliate, massage, and moisturize in one easy step.